Sitting the majority of the team’s big-name players in preparation for the playoffs didn’t stop the Kansas City Chiefs Sunday, as rookie QB Patrick Mahomes got a win in his first career start. The Chiefs kicked a field goal as time expired to break a tie and beat the Denver Broncos 27-24. 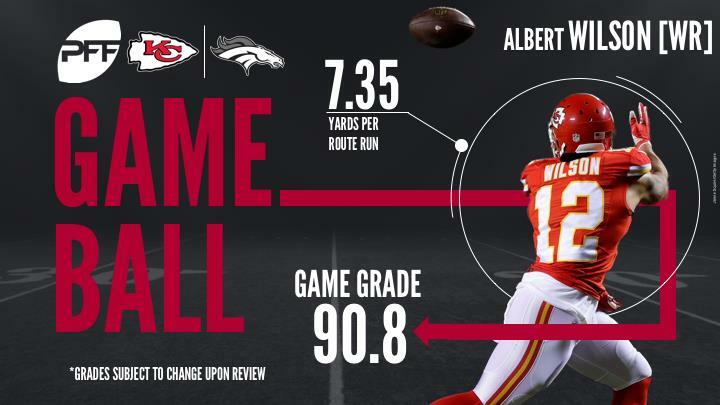 With Tyreek Hill and Travis Kelce not involved in the offense, the Chiefs’ passing game went through Albert Wilson. He caught 10 passes for 147 yards Sunday, the only player on either side to top 65 yards from scrimmage. It was a solid debut for Chiefs’ rookie QB Mahomes. While he still had a lot of his college-style “scramble and try to make a play” game in him, he made some truly special throws. His across-the-body throw with 1:44 left in the game was one of the better throws you’ll see all year. Mahomes was much better when not under pressure, completing 14-of-19 passes for 174 yards compared to 8-of-16 for 110 yards and a pick when pressured. With a few members of the starting offense sitting out of the game, Mahomes relied mainly on Wilson as his main target. Wilson delivered with a 10-reception performance (11 targets) for 147 yards. Seven of his catches went for first downs while two others turned long-distance situations into short ones. Wilson averaged an unbelievable 7.00 yards per route run on the game. Jones saw his playing time limited, as he was on the field for just 27 snaps. But he made them count, as he racked up three total pressures in 18 pass-rush snaps. Of course, one of those pressures was a strip sack that was returned for a Chiefs touchdown. His pass-rush grade of 84.6 led the team and he also chipped in with a solid 76.7 run-defense grade. While Jones was impressive with his pass rush, it was Hamilton’s run defense that made him a top-graded player. Hamilton ended the game with a run-defense grade of 84.3, the highest on the Chiefs defense. While he made just one solo run stop, he was a constant presence in the middle of that defense and wreaked lots of havoc against the Broncos run game. Anderson impressed for the Broncos offense despite not overly impressive surface numbers. He rushed the ball 18 times for 61 yards, with 30 of those yards coming after first contact. He made some tough runs look easy though and picked up numerous first downs when the blocking didn’t always go his way. Anderson also forced a missed tackle. It was a tough go of things for Lynch, who struggled for most of this game. While he did have a couple of nice deep throws (2-of-4 for 52 yards on 20-plus-yard throws), he struggled with accuracy and decision making. Lynch was able to handle the Chiefs blitz very well, completing all eight passes he threw when blitzed for 94 yards and a touchdown. It was when they sat back in coverage where he struggled to the tune of 13-of-23 for 160 yards, a touchdown and two picks. Walker was a very even presence for the Broncos defense, finishing with near-identical run defense and pass rush grades of 81.2 and 81.9 respectively. On 22 pass-rush snaps Walker got himself a sack, a hit, and two quarterback hurries. Against the run he made two solo run stops and was consistently affecting plays in a positive way for the Broncos defense. Carter looked very good in pass coverage in this game. While he played just 12 coverage snaps, he saw just two targets and allowed only one reception for a mere seven yards on third-and-long to prevent a first down. On the other target he made a great pass defense to prevent the play.